The conventional picture of life in an Allied POW camp conjures up images of daring escapes (Colditz and The Great Escape) or the terrible brutality of the Far East (Bridge on the River Kwai). But these stories conceal the much more compelling battle of every day life behind barbed wire. As this extraordinary and deeply moving book shows, prisoners displayed amazing ingenuity and determination to turn their camp into a hive of activity. They used Red Cross parcels to make musical instruments, cooking utensils, even holes for a golf course. In the Far East doctors used bamboo and scraps of rubber to save lives; a magician performed tricks to earn extra food for his friends. Many sat exams and learnt languages. A few wrote books that became bestsellers; others studied birds in research projects that became definitive monographs. The future abstract artist Terry Frost took up painting with a brush made from horse’s hair and bits of old tin. St Trinian’s creator Ronald Searle developed his inimitable style as a POW in the Far East. Many future actors learnt their trade on improvised stages, and Dad’s Army star Clive Dunn found inspiration for Corporal Jones in a German POW camp. Midge Gillies – whose own father was a POW – has uncovered startling new material and interviewed ex-prisoners to produce a work of social history that will redefine our picture of the camps and renew our admiration for the men who survived them, and the families who waited at home. Feature films have created the stereotype of the Second World War prisoner of war. He is the spruce, stiff-upper-lipped Alec Guinness in The Bridge on the River Kwai, or Steve McQueen's cunning and opportunist 'Cooler King' in The Great Escape, the all-American motorbike hero. If he is imprisoned in Europe it will have to be in the forbidding North German Schloss of Colditz or the tunnel-riddled Stalag Luft III. But, as Midge Gillies shows in this groundbreaking work of social history, the true experiences of nearly half a million Allied servicemen held captive during the Second World War were nothing like the Hollywood myth - and infinitely more extraordinary. The real lives of POWs saw them respond to the tedium of a German stalag or the brutality of a Japanese camp with the most amazing ingenuity and creativity. They staged glittering shows, concerts and elaborate sporting fixtures, made exquisite ornaments - even, amid the terrible privations of the Thailand-Burma railway, improvised daring surgical techniques to save their fellow men's lives. Whatever skills or hobbies they took with them to captivity they managed to continue and adapt - to the extent of laying out a 9-hole golf course between the huts of one German camp. They took up crafts and pastimes using materials they found around them: even the string from a Red Cross food parcel was used to make cricket balls, football nets and wigs for theatrical performances. 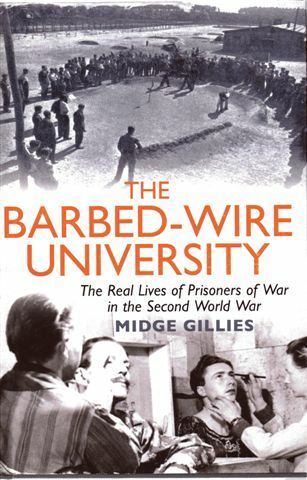 Men studied, attended lectures, learned languages, sat for qualifications and exams, on such a scale that one camp was nicknamed 'The Barbed-Wire University'. A number of books written by POWs in captivity are still in print today. And often the years in captivity proved a turning-point in their lives, as the new interests and skills they took out of the camp enabled them to embark on a post-war career in which they would succeed at the highest level - whether actors like Clive Dunn and Denholm Elliott, artists like Sir Terry Frost and Ronald Searle, or the birdwatchers who studied rooks and jackdaws beyond the perimeter wire in distant parts of the German Reich and went on to run the Royal Society for the Protection of Birds. Drawing on letters home, diaries and interviews with redoubtable survivors now into their nineties, Midge Gillies recreates the daily lives of a truly remarkable group of men. It is a story by turns thrilling, funny, desperate and moving, but never less than inspirational.